Before he flies to the United States this week for another six months of chemotherapy treatment, Davao del Norte District 1 Congressman Anthony Rafael del Rosario in a press conference last Thursday hinted that the Congress he would be entering would still be pork-barrel laden, but if it so he would be allocating P1 million each for Davao del Norte barangays. In the press conference last Thursday when he bared there has been a relapse of his Hodgkin lymphoma cancer, the newly-sworn Cong. Del Rosario said however that in infusing the P1 million from priority development allocation fund from Congress he preferred that projects to be funded by it in barangays should be identified by the Barangay Development Council and requested by a “multisectoral resolution” rather than by the barangay officials only. He said that it was during the last campaign period when he heard of gripes about barangay officials accessing pork barrel funds without the large knowing of their barangay folks. “If I’ll give P1 million worth of projects, the provincial government will also give P1 million,” he said referring to the NOEL (No Barangay Left Behind) that has been actively pushed by his father Governor Rodolfo del Rosario. But Cong. Del Rosario said that the P1 million maybe too large an amount to a small barangay. He hinted though that the amount of fund allocation to the barangays maybe considered on a case-to-case basis. In last Thursday’s press conference held at the Capitol’s Media Center in Tagum City, Cong. Del Rosario admitted that he has to undergo new chemotherapy treatment for the next six months by the Standard Cancer Center in the United States to combat symptoms of hodgkin lymphoma cancer that his doctor found out to have recurred. Thursday morning he took his oath before a regional trial court judge in Tagum City. By this week he is expected to fly to the US after he could meet with President-elect Noynoy Aquino and Liberal Party national stalwarts. During his treatment, he is expected to be on leave from Congress. Davao del Norte District 1 Congressman Anthony Rafael del Rosario in a press conference bared that considering the lacking numbers of the newly elected Liberal Party congressmen he is “sure that a horsetrading is happening” between the LP leaders and congressmen in other political parties to ensure the speakership of Quezon City Congressman Feliciano “Sonny” Belmonte Jr.
140 votes are needed (for Belmonte to be elected as speaker),” he said. He said that he heard about moves of getting support from the Nacionalista Party of Senator Manny Villar, who lost in the last polls, and from the Nationalist People’s Coalition of businessman Danding Cojuangco. Lately also Belmonte said in a report that he already got the support of some 60 congressmen from Lakas, Cong. Del Rosario relayed the information. In the same conference, Del Rosario said that during their national LP fellowship in Manila elected LP congressmen were given application forms to fill up asking them on what House committees they were interested to become chairmen or members of. He said he applied to be either chairman or member of among at least 15 committees including the committees on legislative franchises, energy, public works, agriculture, health and natural resources and others. Cong. Del Rosario added that he particularly conveyed his interest to LP secretary general Joseph Emilio Aguinaldo Abaya to become the chair of the committee on games and amusement and a member of the committee on appropriation. He added that Abaya told him that the many have been aspiring to become members of committee on appropriation being an influential one. Regional police chief superintendent Atty. Pedro Tango bared that his directive to all police units in the region including in Davao del Norte to run after all forms of gambling has remained to be in effect and without let up. He said before local reporters after Wednesday’s blessing and inauguration of the P14-million provincial police headquarters in Tagum City that particularly in the province he heard many station reports on arrests of persons engaged in gambling “especially video karera”. “But it is not only video karera”, he said adding that, “other illegal gambling activities including last two are included”. He said that his policy remains to give no special treatment to criminals and offenders. He also said that would still be “no let up” in the cleansing of bad eggs in the PNP. Police Chief Supt. Tango said that the making of the PNP as a capable, effective and credible organization through the PNP’s transformation initiatives has been going well and it included the laying of infrastructures needed by the police like the just inaugurated new PHQ building. Doing like a-Phoenix , the provincial environment office in Davao del Norte has managed to reconstitute its vital records such as survey maps and data that were eaten up by a fire that razed down the entire environment building three years ago. OIC provincial environment officer (PENRO) Teodorico Julogan said in an interview with the Valley Chronicle that in reconstituting their vital records like survey’s technical descriptions and copies of titles they resorted to getting copies from the regional environment office and registry of deeds. Hulogan said that their records are all well now unlike before when they were left empty handed in meeting requests of the public for certified copies of records months and even a year after the fire that ate up the PENRO building dawn of July 7, 2007. He said that the fire was already a closed case with the Bureau of Fire Protection (BFP) attributing to faulty electrical wiring as the cause of fire. “Governor (Rodolfo) del Rosario was really surprised of Binay’s victory,” recalled Davao del Norte Congressman Antonio Rafael del Rosario. He said that the governor reacted to be “shocked” after learning that Vice President Jejomar Binay suddenly surged to be ahead to Mar Roxas in the early reports of the national counting in the May 10 polls. But it turned out that it was not only Davao del Norte but the whole Region XI as well where Binay topped in the vice presidential polls, Cong. Del Rosario said. By this week, the congressman will fly to United States for his second six-month therapy treatment for his Hodgkin lymphoma cancer that has recurred. He will be on leave from Congress for six months. Asked on what was his Gov. Del Rosario’s reaction to him who first went to support President Noynoy Aquino before other provincial leaders including his father governor went Liberal, Cong. AGR played coy and instead shot back that before the campaign period he already supported Noynoy whether the latter would win or not in the polls. After the dust settled in following the May 10 polls, our winning candidates have respectively sent their statements of contributions and expenditures to the Commission on Elections. And alas, they complied with the Fair Election Law and its derivative implementing rules and regulations. Under the law, local candidates can only spend a maximum of P3 per registered voter. But for the man of the street who has long known of the vagaries of our recent elections, at worst many of them have perfunctorily complied with an outdated, useless law that has never put a brake to the slide of our constitutional right to choose leaders under the grip of an abysmal culture of vote buying or to put it mildly, the culture of incurring so much expenses before one is elected to public office. We are quite sure that many are seeing that the expenditure reports of our winning politicians are nothing but a mere scrap of paper meant to comply for the requisitorial aspect of the law, and hence evade from possible prosecution out of not submitting, which nonetheless has never happened to any electoral victor in our midst in our country anyway (and we heard none of this yet). The reporting exercise is but mere telling a lie for the obvious except those done by truth seekers or nuisance and poor candidates who had either none or lacking of an income to wage a winnable electoral fight. There is a circus in everything about this although we know that at least the law serves as a reminder of sort that in our own elections we have a cap to the expenses of our candidates and this cap is purportedly aimed to have fair elections for the rich and poor candidates alike. But how imaginary is this rationale of the law when in practice both the winners and the leading losers, like in the just concluded elections we have had in our provinces, showed their priority and obsession of winning, by hook or by crook even as they have ushered a so costly electoral culture that they themselves, the breed of politicians, would not benefit in the next elections by 2013. Particularly, now we know of the further sinking of the type of elections we already have in Davao del Norte and Compostela Valley as shown in the last two local elections: that our election is so costly now as politicians themselves have catered the avaricious lust of the money-conscious, vote-selling ward and village voters through the vote buying practice. Yes, largely we have had peaceful and automated elections but the vote-buying has all become more glaring and costly that it seems in the 2013 elections nobody would seem to be already interested to run for public offices, chief of which is for the highest post of the legislative area, knowing now of the prohibitive costs of becoming candidates. At this writing, Davao del Norte District 1 Congressman Antonio Rafael del Rosario would already be in Manila. When we got him for a follow-through interview last Thursday afternoon after his press conference at the Davao del Norte Capitol’s Media Center, he said he might be leaving for United States by Thursday. “It’s 90 percent that I be treated by the Standard Cancer Center,”he said adding that there’s indeed a relapse of the hodgkin lymphoma cancer after his Singaporean doctor found anew symptoms of the disease following medical examination he underwent last week. So since Thursday AGR, now a full-pledged congressman, is hot news again these days. 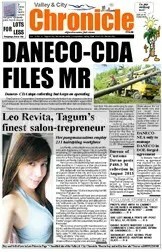 In the morning of Thursday, he was sworn into office by an RTC judge in Tagum. Surely, he could not be around when his father Governor Rodolfo del Rosario and most especially the winning LP boardmembers in the District 1 would take their oath of office on June 30. The next day after is Davao del Norte’s Araw. The new congressman would be on leave from Congress by July 1, the very start when all elected officials in the country assume office. And for the next six months he’ll be on leave when he’ll undergo his second series of chemotherapy treatment. Surely, especially people who recently voted for Cong AGR and the people who know of his candidness and kindness will surely miss him. Von voyage Cong. AGR. We heard that Raffy del Rosario, younger brother of Cong. AGR, is the incoming congressional chief of staff of AGR. With it, Raffy del Rosario (another RDR in initial) becomes the next Del Rosario political heir. Davao del Norte provincial administrator Rufo Peligro is reportedly going out from the Capitol for a new task given by Governor Del Rosario. Sources said that the next provincial administrator would be picked from among the three: former provincial prosecutor Atty. Ruben Pasamonte, Atty. Jennifer Namoc and SP secretary Dennis Dean Castillo. Why not Atty. Pasamonte when he is known to be makamasa? Why not also beauteous Atty. Namoc when new Davao City Mayor Sara Duterte picked up a pretty, brilliant lawyer Zuleika Lopez as her city administrator? Why not also Castillo when he’s also capable to handle the tough job? Hard choices indeed. But Castillo would be better remaining as a career, tenure-secured SP sec employee than become a functionally co-terminus one. I’ll doubt he’ll let go. 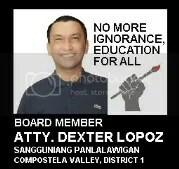 They said that the post of an administrator in LGUs is like a chopping board (tadtaran). The administrator is the whipping boy/girl and it seems all fingers would point to the him/her in whatever big failings and for controversies that dragged the name of his appointing person, his boss, the mayor or governor. The truth is: the administrator is the man in charge of all the ground ops and the paperworks. The mayor or governor usually doesn’t really know the nitty-gritty of the paperworks and details of the ground operations. The mayor or the governor signs and approves when his administrator’s initial or signature is already there. The mayor or governor gives his order after his administrator has already given his thumbs up. The administrator does the complete staff work for the mayor or governor. The former lightens the burden of governing of his/her boss who usually does rapport with the people. He eases up the hellish job of his boss of catering to the unsatiable wants and needs of the ever soliciting barangay people, purok, barangay and sectoral officials, who constantly ask for help from split ends to ingrom, from crib to grave. In Philippine bureaucry, the administrator is the man/ woman in charge in logistics and supplies, in bids and awards of toothpick to battleship, so to speak, ensuring that whatever transactions, legal, semi-legal or illegal, must always be neatly done and aboveboard to COA rules and regulations, so his/her boss could be away from any controversy or litigation. The administrator is not the be-all and end-all factor in the success of the administration of his boss. But he/she is the reason of the efficiency or inefficiency in the public service in the munisipyo or kapitolyo. If he/she is pasaway, his boss suffers without his boss immediately knowing about it until his/her sipsipan would be uncovered by a jackal or joker who has managed to come close to the inner circle of his boss. The administrator and the mayor or governor must then be close to each other. Naturally, the administrator must have all the trust and confidence of his mayor or governor.